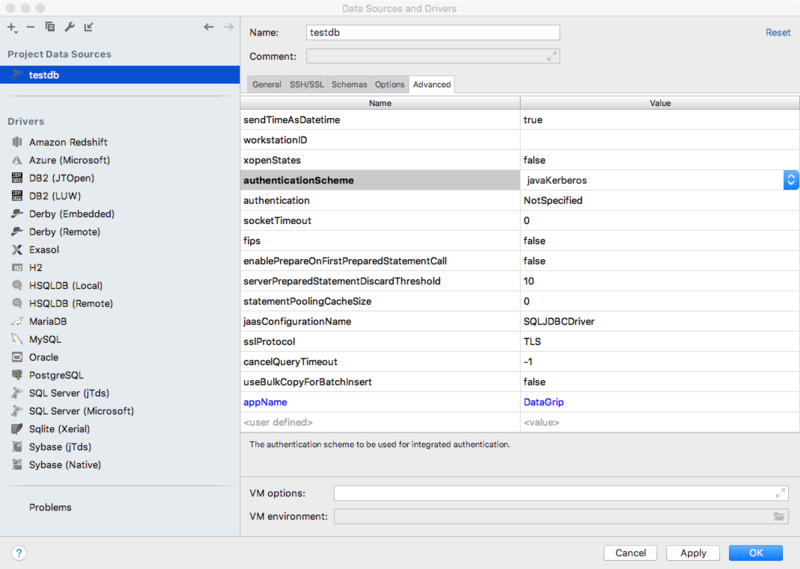 How to set SQL Server Authentication Method in DataGrip? Is there a way to specify the authentication method (SQL Server or Windows Authentication) when connecting to SQL Server with DataGrip? I have tried configuring using both the SQL Server(jTDS) and the SQL Server(Microsoft) drivers and don't see an option on either. This is dependent on the settings for the connection/data source. In the "General" tab, if specify your Windows/AD Username in the User field. on the "Advanced" tab, in the DOMAIN property, specify the domain for the Windows account you put in Step 1. If you don't specify the domain in step 2, it will assume you are doing a SQL Server Authentication login attempt. I couldn't get this to work on OS X, but most people seem to have no issues on Windows. 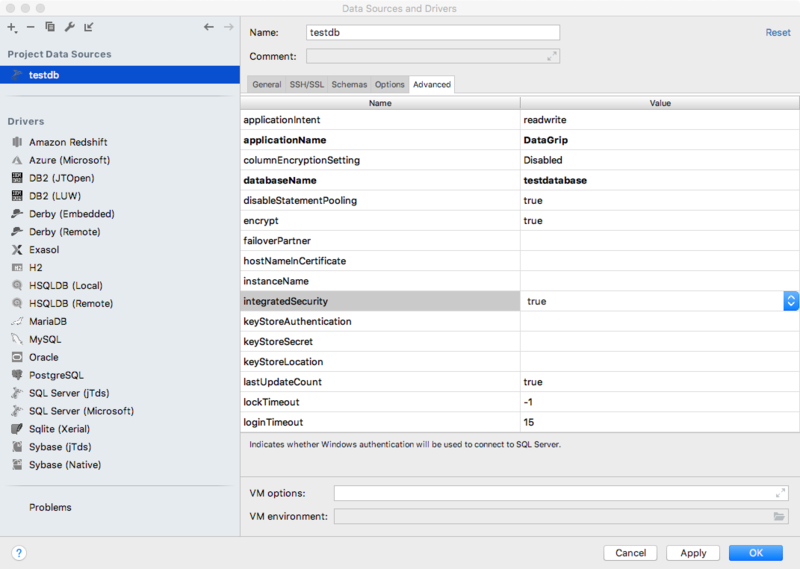 In the "Advanced" tab for the data source, set integratedSecurity to true. n.b. you may have to also set this property for the actual Driver as well, on OS X i was getting continually "This driver is not configured for Integrated Authentication", but that could be OS X thing. 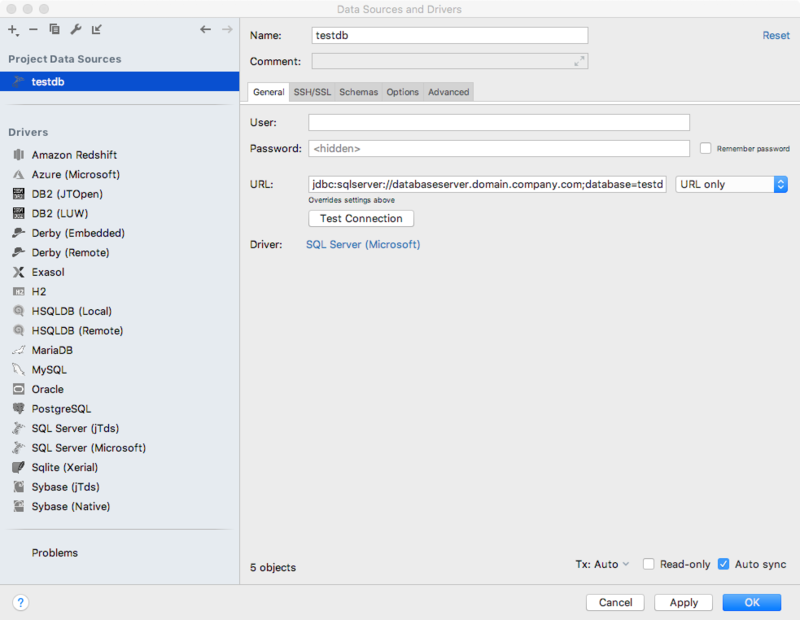 I was able to connect on MacOS in Intellij 2018.2 using the Microsoft 7.0.0 SQL Server jdbc driver. Make sure to set the jdbc driver to use integrated security and Java Kerberos. If you leave the drop down next to URL on "default", it will attempt to use a user name/password, which is not what you want if you're using integrated authentication. Also, please make sure you know what you're doing if you leave "trustServerCertificate=true;" in the URL. In production, you should properly setup your certificates, but that's not in the scope of what's being asked here. Not the answer you're looking for? Browse other questions tagged sql-server datagrip or ask your own question.